Click to Enlarge! My new skis are here! The air is cooler, the fall issue Buyer’s Guides are on the shelves, and the leaf peepers are out in their autumnal foliage feeding frenzy. All of this means that the time for the annual ritual of selecting and buying new ski stuff, or of cobbling together a brand new set up out of a lot of old equipment, has finally arrived. Are you ready? I was beyond ready; in fact I resorted to magic this year. I crammed all my favorite old stuff into a bag. And waited for it to transform miraculously into something brand new; this only took two weeks and a credit card number to accomplish. 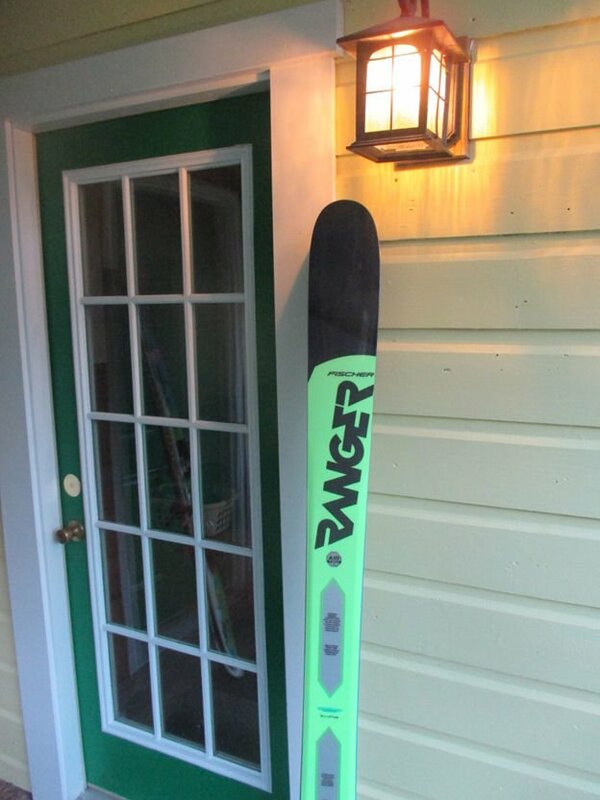 And Voila, as the Austrians say – the Fischer Ranger 108, my choice for the ski to rule them all. 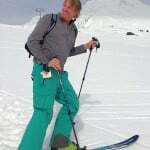 This is my final campaign in the battle for the one ski quiver. I have made the case very strongly to my non-skiing wife: this is my last purchase, I will ski these until both tips and tails are ground to their carbon encrusted core. Still, she is suspicious and remembers previous “last” skis; the P4, the Enforcer, the Nomad, the Savory 7, the Cham97, and of course, the Billy Goat; perhaps she has a point, there is no last ski. They are all so damn cool. But every iteration (exception being the Billy Goat) has been lighter and stronger, the carbon matrix fabric at the ends and reduction of titanal from the whole ski to only underfoot has added up to a real difference. 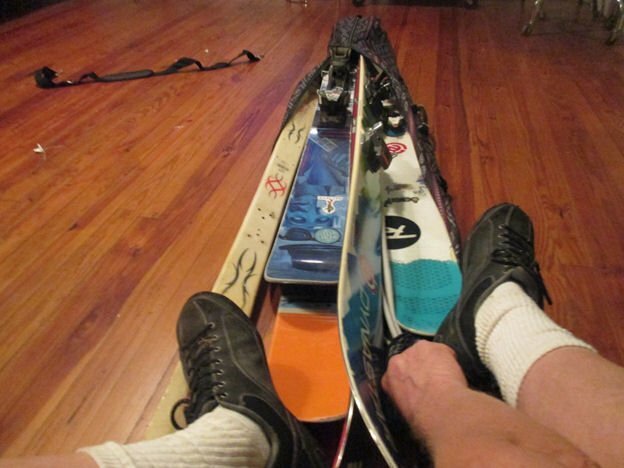 Without ever resorting to the footrest on long lift rides, I can still have a ski that will float on powder and press through crud and debris. If I was going to be stuck on a tropical island in the post apocalypse I would still want these if only for their structural integrity (I think they could be fashioned into a serviceable ridge beam for a small hut), if the radioactive dunes had any slope and vert that would just be a bonus. The truth is I just like skis, even as some people like cars I guess, or kittens and turtles. Do not try and ski on the former or the latter by the way. However I will admit that my choice of skis defies reasonable logic for the southeast, but I persist. 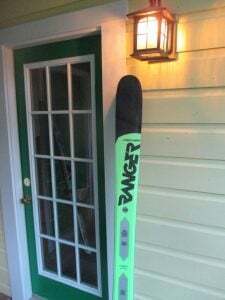 Here is what I mean by that; years ago I was an early adopter of fat or wide-waisted skis, 90mm plus; then 100 and now here I am with a new ski that is 108 mm in its middle. 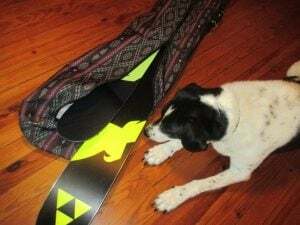 And yes, some might consider that over-sized, but I continue to buy skis that suit my most hopeful expectations, there is a statistical possibility that the opening day at Cataloochee may coincide with a blizzard and if so I will be ready. The jokes about my skis looking like water skis will seem pretty silly then; as they will later in the season on the occasion of Beech’s closing day pond-skim event, to say nothing of the many powder days I expect in between. It’s a new season and I am full of hope. This leads me to the broader question of how you choose your skis. I got lucky this year and demoed a lot of this season’s skis at the SIA show last January which led me to my choice of the Fischer Ranger; but so many skis were good; Blizzard Brahma and Cochise, Moment Deathwish and Underworld, Voile V6, Atomic Backland, this is a uniquely innovative time for ski design, and there aren’t actually many lemons out there anymore. Generally demos are the best way to choose skis if you can (demo being short for demonstration and hopefully not actual demolition of the borrowed ski, The manufacturer’s reps are funny about that). Beech, Snowshoe and some others do a good job arranging slope-side demos with manufacturers on given days during the season; unfortunately no one in the southeast to my knowledge has affordable demos out of their shops. No fault to them, but it would be neat. Of course one can read about it too, the magazines are out and assuring us that slimmer waists and newer more snappy profiles are there awaiting our expertise. One issue I would take with the magazines is the projection that we are all Cody Townsend or Angel Collinson just waiting to find our destiny ski. Personally, I don’t think it will fulfill me but I do feel lucky to have such advanced gear at my disposal. It feels like cheating I suppose since I can recall the rental gear I grew up on in the seventies and expect I might be banished to ski it again if anyone actually pays attention to my form. I try to stay in the trees to avoid the style police. Last thing, if you live close to a retail store and like to actually get hands on the equipment go and check them out. 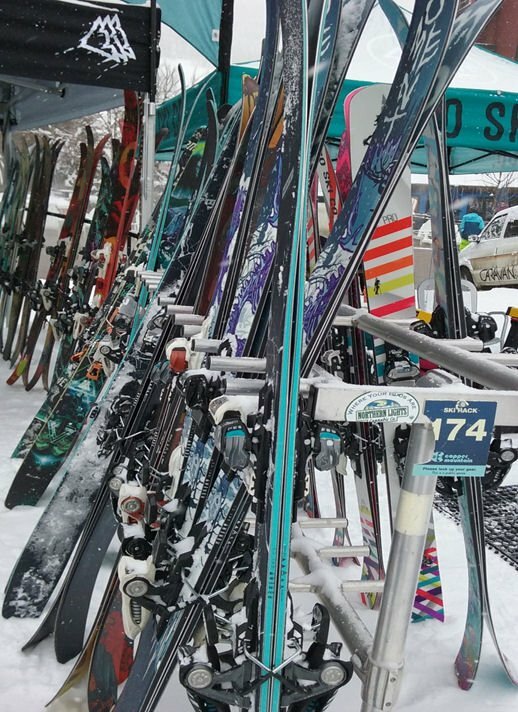 They have the hard goods, their prices are competitive with stuff online and they are real people who also like to ski and have made it their living. 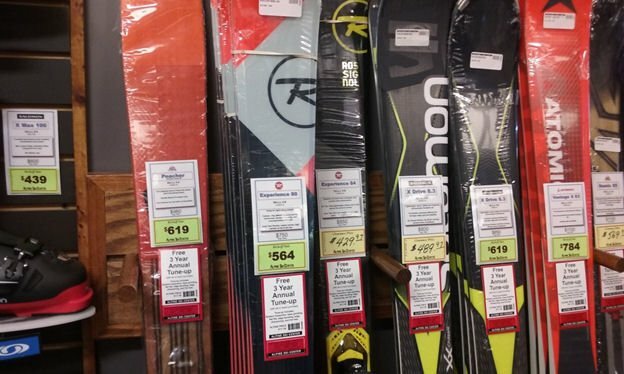 A real ski shop is also a great place to find a boot that actually fits. The new gear is amazing – the best, strongest and lightest equipment ever. Terminology like “reduced swing weight” had always struck me as bogus, as did the supposed merits of a carbon matrix tip. But if you pick up the skis like I’ve mentioned, you can feel the difference in your hand, and having skied them I know it’s true on the slopes. I guess I could follow the trend of returning to skinny waists but if the skis are this light and a powder day is always imminent (and it always is if you have a high tolerance for statistical improbabilities, and I do) – then you’ll see me on my oversized sticks – Say Hi.